SERVICES - Technical Services Inc.
We have five Yamaha surface mount pick and place lines with in-line board handlers, stencil printers, re-flow ovens, 5 Yamaha YSI-V AOI systems. 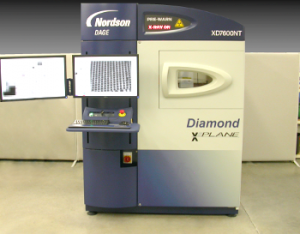 Our surface mount department boasts accuracy, speed and dependability. We can now deliver over 1,000,000+ component placements per hour, giving us a monthly capacity of over 250 million parts! 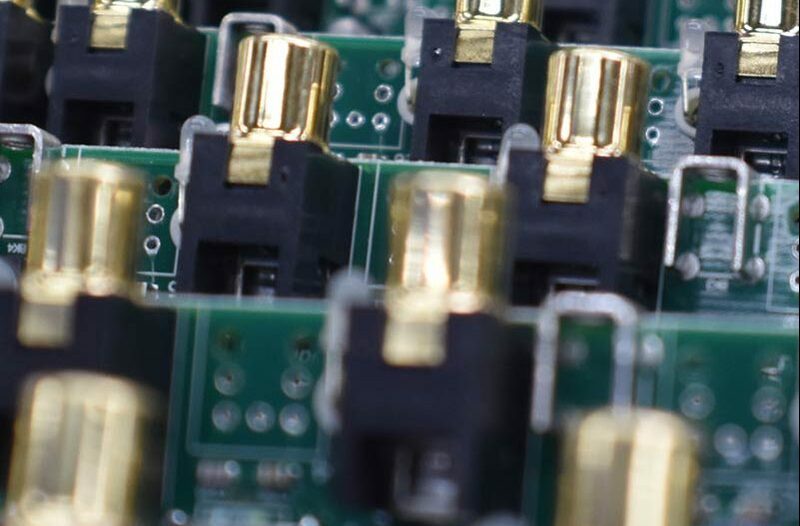 We have over 22+ years of experience in the assembly of surface mount products, and our quality and timely delivery reflects this. Our SMT personnel undergo continuous training in IPC quality standards as well as machine operation and maintenance. Our equipment allows us to place nearly every SMT component from a 01005 chip to QFN’s, BGA’s, and Flip chips – all with speed and deadly accuracy. Our lines are on a comprehensive maintenance schedule that is strictly adhered to, keeping our lines up and running at 100 percent for optimal speed and accuracy. Here at TSI we have a large Through Hole capacity with over 40 years of experience, we have 6 push line systems for extremely high production. All of our Through Hole inspectors are IPC certified. 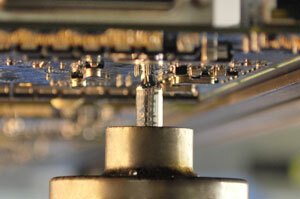 We offer both Leaded and Lead Free wave soldering and have automated inspection. We also offer Leaded and Lead Free Selective Soldering, it can be a viable alternative to hand soldering, our selective soldering equipment and operators can make quick work of any job. 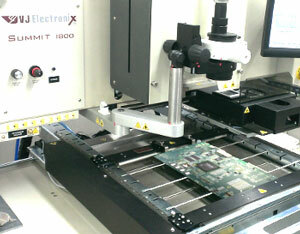 This inspection system has been designed to inspect, and determine the quality of electronic assemblies. This provides us with the ability to investigate the position and size of voids at joint interfaces and other locations in BGA/CSP/QFN/LGA. 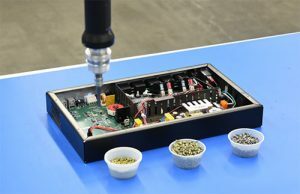 It enables the detection of quality and fill of thru-hole joints & VIA’s or wires that have bent or broken by encapsulation after complete assembly. Now, these and other defects can be located quickly cutting the time to re-test and re-work. This system allows direct visual comparison of component and placement site orientations. Summit 1800S provides the most advanced features designed specifically to address difficult Rework challenges with BGA, LGA and QFN, including Scavenging of residual solder after component removal. 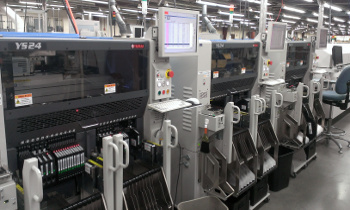 A computer-controlled Pick Up Tube, heating system, and optics system allow operators to quickly and easily perform operations with high levels of precision and accuracy. The CCD television Optics system combines with the computer-controlled Prism Shuttle to provide fast and precise board site and component alignment. Component and board images are overlaid and displayed simultaneously on the computer monitor during part alignment processes. 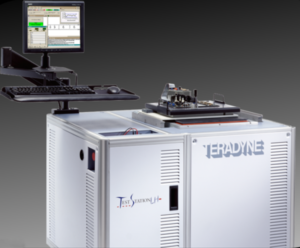 We currently use three Teradyne In-Circuit test machines. With more than 25 years of experience our testing services are simply the finest. We offer in-circuit test to all customers at a very competitive price . Contact us for more information on the benefits of In-Circuit test. We also offer a large variety of functional testing and programming. Our services do not have to end with the assembly of your circuit boards. We have an entire department devoted to the final box assembly of our customers products. Having us perform the final assembly of your products will help you eliminate the use of your internal resources and let you focus more on the more important issues at hand. Hand spray conformal coating of circuit card assemblies has become a core competency at TSI. Since 2008 TSI has been coating circuit boards for key customers in the aerospace industry. Proprietary masking techniques allow for rapid masking and unmasking making TSI highly competitive at conformal coating. Currently TSI sprays polyurethane coatings but is capable of others. UV inspection of the coating is carried out in a special black light room. Inspectors trained to IPC-A-610 Class 3 inspect every coated assembly for coverage and appearance. 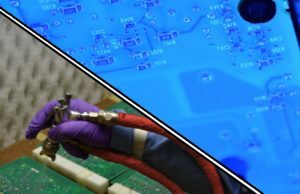 If your products require conformal coating we are pleased to offer it as part of our complete electronics build service. 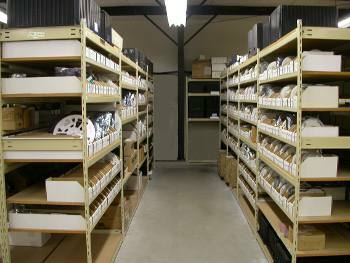 Don’t want the hassle of purchasing and storing your components? Allowing us to manufacture your products through our turnkey services will eliminate all of your component headaches. Since 1991 we have employed our own internal buying team to better serve our customers growing needs. We have extensive buying power and a well established name with our part vendors.